It’s sad, but true. All good things must come to an end. Still, before we were faced with married life in all its gritty glory, we had one last honeyday all for our little family of mummy, daddy and baby. 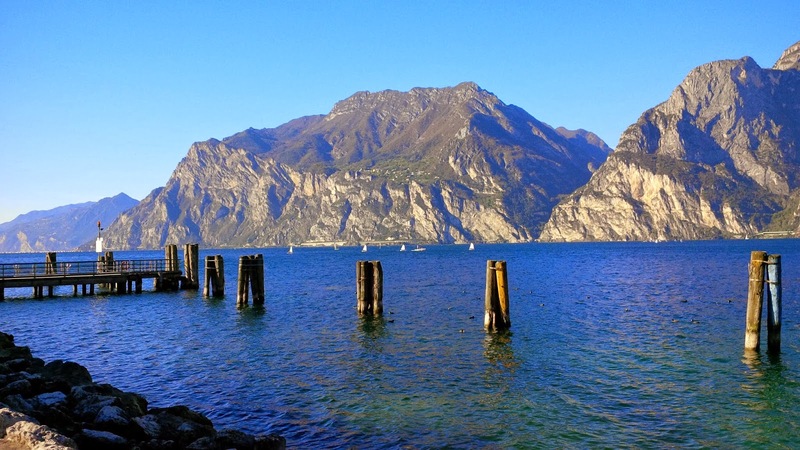 We were at Riva del Garda, right at the top of Italy’s biggest lake, and were planning a leisurely drive down its eastern shores before returning to our home in Vicenza that same evening. Our first stop was the marina. A gaggle of pristine white yachts was moored in the quiet waters with powerful rugged mountains serving as a dramatic backdrop. I used to be very interested in yachting quite a few years back now. In my first year at Uni, every weekend I would hitch-hike with a couple of friends to a large dam about an hour away from Sofia and spend two days happily ploughing its murky waters in a little boat. My favourite moments were when we all had to balance the boat by hanging outside of it, feet tucked securely under the belts running along the bottom of the boat and the cold November air ruffling our hair. In all honesty though, I haven’t been on a boat in a crew capacity for so long now, that it is highly unlikely I would be able to tell my port from my starboard anymore. Still, while we lived in Chatham, we would go to the local marina quite often to admire the big boats moored there. But again, I have to be honest and admit that there were not many places to go to in Chatham anyway and also, Boomers – the Australian coffee shop right next door to the marina – was the main attraction for me with its huge lamingtons and coffees with whipped cream. 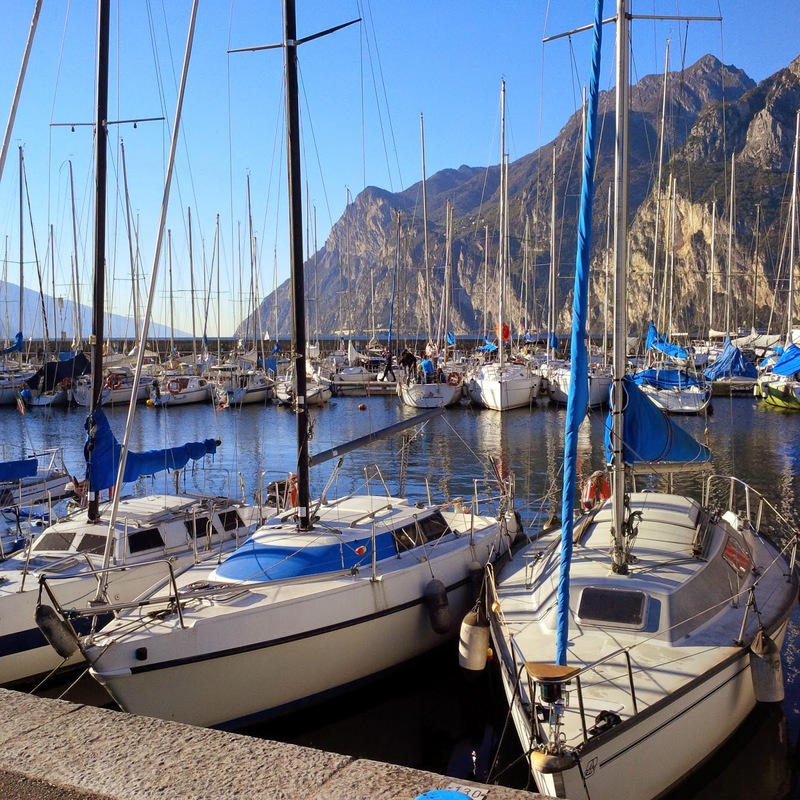 There were no such distractions for me in Riva del Garda, though, so I admired the boats in its marina for a while, noting the beautiful contrast between their white bodies and masts and the blue of the sky. 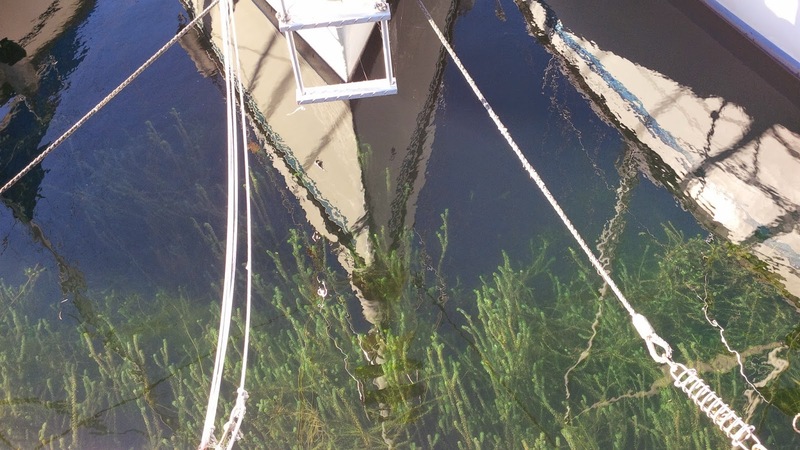 The lake was crystal clear to the point that I could see the long stems of grass growing in its waters. It was time we made a move. We punched ‘Riva del Garda to Vicenza’ in the GPS interface, but for some unknown reason, the GPS lady would only want to take us there by bypassing the lake entirely. At the end, instead of our final destination, we opted to type the name of one of the many villages dotted on the eastern side of the lake. 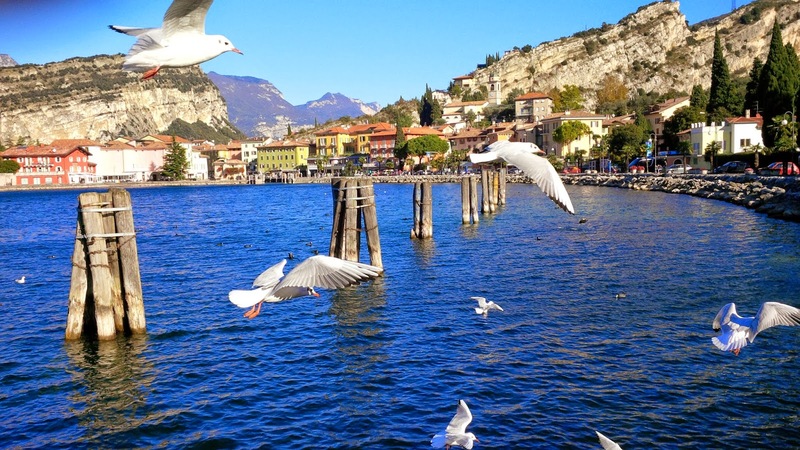 I am glad we did it, as the drive was smooth and easy with beautiful views across the water and, unlike Garda’s western shores, with just a couple of tunnels at the very start of the journey. 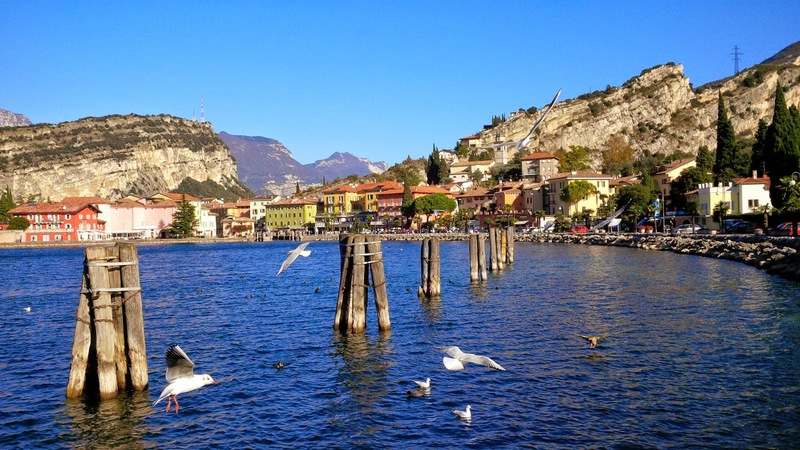 Our first stop was Torbole. A name I easily memorised, as it reminded me of the Bulgarian word ‘торба’ (pronounced ‘torba’ and meaning ‘bag’ or ‘sack’ in English). 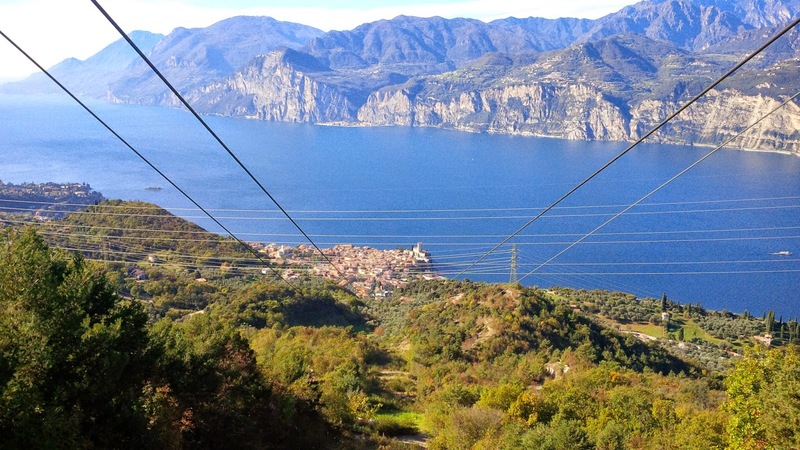 Unlike the linguistic associations it evoked, Torbole was rather nice in the mid-morning sun. An elegant promenade followed faithfully the curve of the lake. We went for a walk, feeling invigorated by the fresh breeze. Armed with a loaf of bread, soon we were attracting the attention of the local ducks and seagulls with the latter scoring top points for swallowing big bites in mid-flight. This reminded me of a German couple that we had observed in the castle of Sirmione on the first day of our short but sweet honeymoon. The man was armed with a really fancy looking camera. The woman was aiming pieces of bread at the seagulls resting on the crenellated castle walls. Dozens of birds would fly up trying to pinch a piece and the man would snap furiously away. Inspired by the professionals, I whipped my Blackberry out and instructed my husband and baby to throw some more bread to the ducks and the insolent seagulls. Not there yet?! One more try. Hmmm, it’s harder than it looks. It was a short drive from there to Malcesine. 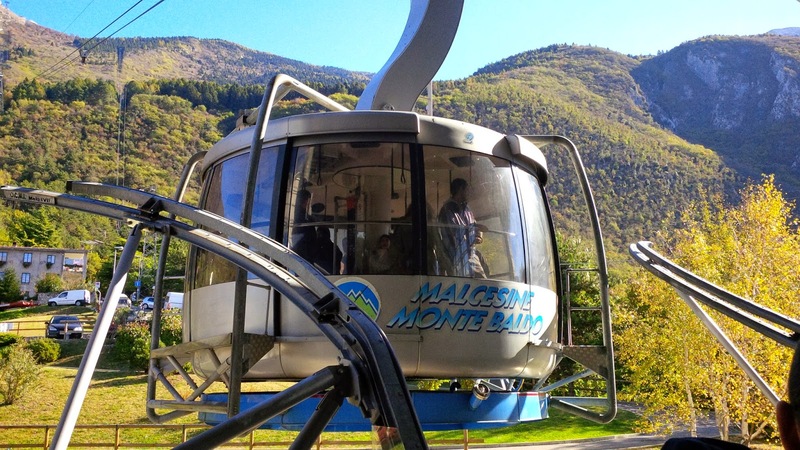 We had decided to return to this charming village, where we had spent a couple of hours the day before, in order to go up to the top of Mount Baldo on the very high-tech looking funicular. Built on the principle of communicating vessels, one of the cabins would go up the steep mountain slopes, while the other would descend almost all the way to the sparkly blue waters of the lake. So, we bought tickets and prepared to board. The cabin, brimming with people, started its ascent. Up and up the mountain we went. Our horizon quickly expanded. Malcesine compacted at our feet. The lake grew bigger and longer. We were starting to get level with the mountain tops on its other side. And then, ping! 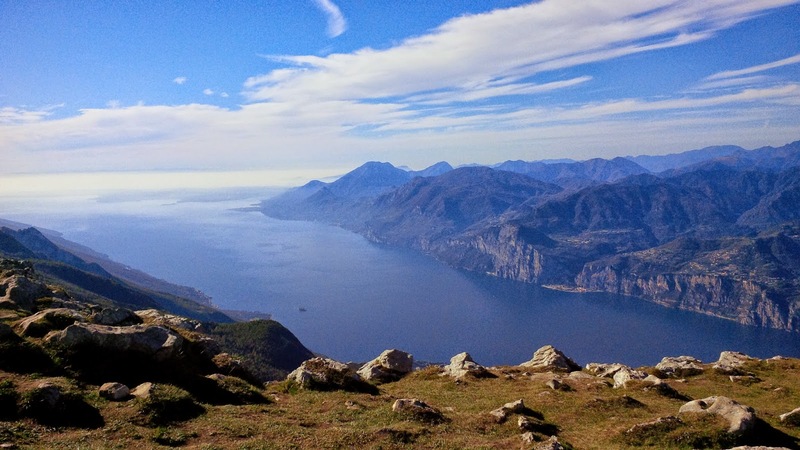 We had arrived at our first stop – San Michele at 560 m height, where we had to take a larger cabin to take us all the way to the top of Mount Baldo. An open air platform provided some inspiring views. A gentleman and two ladies on mobility scooters boarded the cabin first. I have to say that I am really impressed by the efforts made in Italy to improve accessibility for all. I wish things in this respect were happening much quicker in Bulgaria, too. This second cabin was much larger than the first one. Not only that, but once up in the air, we sensed that its floor started to swivel, turning the cabin at 360 degrees over the course of the ascent, giving everybody equal rights to admire the stunning view without pushing and shoving for the best places. We were going up to a staggering for me 1760 m height. Growing by the sea, I never really understood mountains as a child. I found them rather boring in their seeming immobility, incapable to compete with the ever changing nature of the sea. Now, I started to grasp the fascination that mountains exert over us; the exhilarating feeling to reach the top and to see the world in its compact entirety spread at your feet, big enough for you to embrace it with outstretched arms. The cabin was advancing sideways up the slope. Just a few meters away from the station at the top, its swivels turned it slightly so as to face the dock and the sudden movement jolted us all up. That sudden feeling of your stomach dropping down provoked a collective horrified gasp, followed by peals of fraternizing laughter from everyone in the cabin. We were at the top! 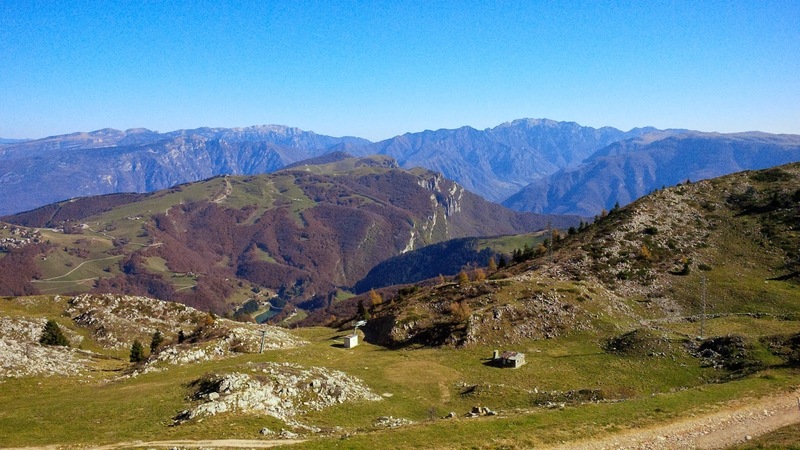 We stood on Mount Baldo, bathed by the midday sun. 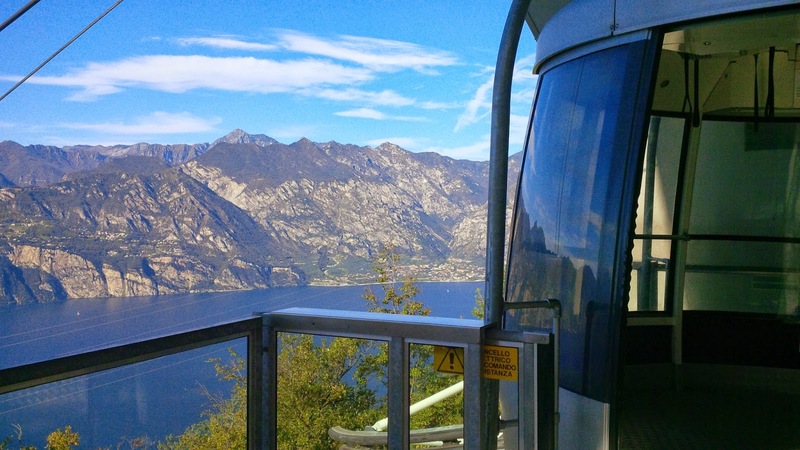 Lake Garda lay stretched between powerful mounts and slopes. It was a moment to commit to memory for my whole life! 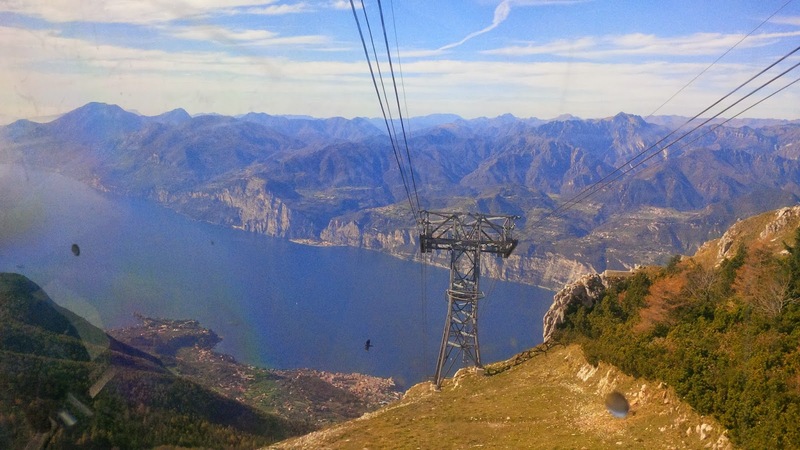 Once we were back at lake level, off we went again, circumnavigating Garda. Our little red car passed by picturesque little villages and towns, more camping sites that I could count and dozens of hotels. 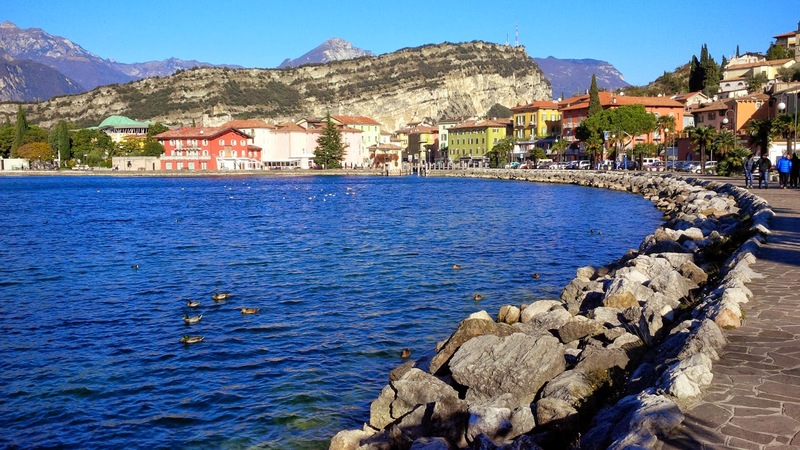 Mid-afternoon, we arrived in Lazise – the only town on Lake Garda we had visited before. Knowing our way around it, we headed straight to the kids’ playground by the medieval castle to give our baby a little run. 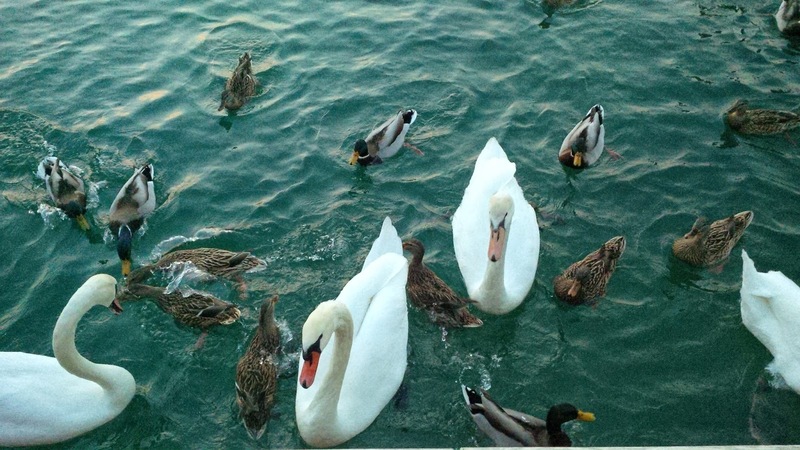 A slice of pizza and a cone of gelato later, we spent some time feeding the local ducks and swans. 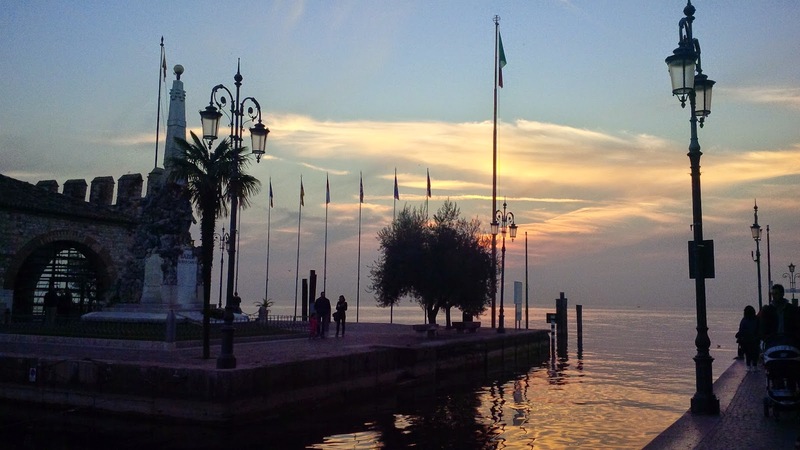 We had spent three wonderful days travelling around Lake Garda and what can you do when you reach a happy end, but to walk off hand in hand in the beautiful sunset and feel alive.